[A study], published in 2011, followed 28,800 subjects with high blood pressure aged 55 and older for 4.7 years and analyzed their sodium consumption by urinalysis. The researchers reported that the risks of heart attacks, strokes, congestive heart failure and death from heart disease increased significantly for those consuming more than 7,000 milligrams of sodium a day and for those consuming less than 3,000 milligrams of sodium a day. Wow, it’s almost like the extreme might be the problem. Sometimes “the dose makes the poison” is worth remembering. OK, I wanted to give people the benefit of the doubt. If the author of the Kickstarter campaign had conflated society’s dislike of visible muscles on women as “pro-fat”. The photo of the author on Kickstarter definitely shows visible abs definition, and yes, “feminine” usually correlates to “few or no visible muscles”. Some women do fear gaining visible muscle and avoid weightlifting as a result. Women bodybuilders are sometimes viewed as “masculine” or “freaky”. Collection of images of women standing up against a society that protects fat culture while bastardizing thin and athletic women. There are millions of women out there and im sure you know at least one looking for a voice , not from tvs and magazines, not from victorias secret.. but from the ground level , to speak up and tell them that its okay to want to be in better shape. But.. if it just makes it into the hands of ONE little girl who feels like she has to be overweight to fit in with the current 70% of the overweight population of America, and it gives her the strength to know that being healthy isnt a bad thing. Then this whole project is worth all the time and effort i can possibly afford to put into it. Obese individuals are highly stigmatized and face multiple forms of prejudice and discrimination because of their weight (1,2). The prevalence of weight discrimination in the United States has increased by 66% over the past decade (3), and is comparable to rates of racial discrimination, especially among women (4). Weight bias translates into inequities in employment settings, health-care facilities, and educational institutions, often due to widespread negative stereotypes that overweight and obese persons are lazy, unmotivated, lacking in self-discipline, less competent, noncompliant, and sloppy (2,5,6,7). These stereotypes are prevalent and are rarely challenged in Western society, leaving overweight and obese persons vulnerable to social injustice, unfair treatment, and impaired quality of life as a result of substantial disadvantages and stigma. — Rebecca M. Puhl and Chelsea A. Heuer writing in “The Stigma of Obesity: A Review and Update” published in Obesity. Look, I get that nobody’s life is perfect. There’s a reason the Romneys believed their college years were a “struggle”. There’s a problem with how our society regards bodies, especially women’s bodies, as open to public discussion. But I have trouble believing that a thin, fit woman is going to be less likely to be hired than a fat woman with the same qualifications. I have trouble believing that a fit, thin woman is going to be told to gain weight to when she goes to the doctor’s. And I certainly don’t buy this belief that women need to be told it’s okay to want to get into better shape when every women’s magazine assumes getting into better shape is every woman’s dream. In October I noticed I was having more anxiety about the whole “going to the doctor” thing. I ended up calling the asthma specialist I’d been referred to at least six months previously and going in on Monday. This was stressful in many ways. I’m freak-folks-the-hell-out fat. I’ve got the whole mental “You mean it’s asthma, not just that I’m fat and out of shape?” thing going. There’s getting through my first Thanksgiving without my father. There’s that fall is the most stressful time of year at work. But I went. Some of it was new to me, such as being handed a tissue with a length of plastic wrap on top and being asked to blow my nose. (Ruled out infections.) Also a lung function test, where I breathed out, in, and out through a measuring device. As weight can factor into dosing of asthma meds, I did get on the nifty digital scale .. which displayed the ever-useful “ERR”. Oy. I did tell the nurse my weight, and she made no comment. Blood pressure was fine, both in terms of my specific measurement, and that the room I was in had the proper-sized cuff and the tech taking my blood pressure used the large cuff without me needing to request it. I met with the doc to discuss my history and current symptoms. We agreed to doing some skin tests to confirm and/or rule out current allergies. My biggest responses were to dust mites, grasses, and dog dander. Hence Operation de-Dust Mite, which included encasing our king-sized mattress in a “protector ” to keep the dust mites inside it. Side note: wrestling a king-sized mattress into a giant zippered pillowcase? Hilarious. Ended up putting the mattress on its side, propped against the headboard, to get the thing on. What struck me the most, though, was that the doctor did not blame anything on my weight. No question that exercise is an asthma trigger for me. Not “Are you sure you’re just not used to exercise?” Doc accepted that it’s a trigger, saying something like, “Smoke, exercise, going out in the cold, those are very common.” I half expected to hear “Exercise will help improve your lung capacity” but there was no mention of exercise or weight loss. Treatment plan added a few new meds to better control my asthma and reducing overall exposure to allergens, especially in our bedroom. I’m glad it was a good experience. I am less thrilled that it was a surprise and not business as usual for me. I’m sorry if this offends anyone, but I don’t necessarily care about New York’s proposal to ban larger-than-16oz-sugary-sodas. Partly it’s because I’m not affected; I live in Seattle and haven’t even sampled non-diet pop* in years. I am skeptical that it would make fat people thin, naturally, but I think it would be more likely to affect the budgets of folks who are grabbing lunch or dinner between work shifts than anything else. Having to buy more drinks will cost more, and water isn’t always free in delis or restaurants. And that, I think, is what people aren’t realizing. Preventing people from buying large pop servings isn’t targeted at fat people. It’s targeted at poor people, at workers, at kids. *I’ve occasionally had sugar or corn-syrup sweetened pop at parties over the last few decades and ended up with headaches. I haven’t drunk “real” soda regularly since 1985. Currently I drink water, diet Pepsi and coffee with half-and-half and Splenda most days. Knowing intellectually that people can die of asthma is a bit scary. Reading that a friend of a friend died of an asthma attack is another. Death from asthma is a relatively uncommon event, and most asthma deaths are preventable. It is very rare for a person who is receiving proper treatment to die of asthma. However, even when it is not life threatening, asthma can be debilitating and frightening. Asthma that is not properly controlled can interfere with school and work, as well as daily activities. Of course, proper treatment is often dependent on affordable medical care. I carry with me an albuterol inhaler and antihistamines to deal with allergic asthma. Not everyone can afford them. Also: some don’t believe they have asthma. For decades I didn’t believe I had asthma, despite having allergies, because I was fat — I was supposed to breathe hard, right? Shortness of breath means “obese”, right? Wrong. (Misdiagnosis occurs, too.) But getting properly diagnosed means medical practitioners need to look at the symptoms and not the body weight — and having affordable practitioners and treatments available in the first place. I live in a country with treatments available, and they’re affordable for me because I have a computer science degree. Other people aren’t so lucky. My mother was fat, though she lost weight shortly before she died. My father, by contrast, was always thin and muscular. Yes, he drank like the Navy seaman he’d been and smoked 1-2 packs a day, but he was strong and healthy. He gained some weight when he retired and quit smoking, but not much. Heck, he’s lost some in the last few years. Why? He wasn’t exercising as much. Turns out he’s anemic. Why? Bleeding from a cancerous tumor. Oh, and he has some short-term memory problems, which means he shouldn’t live alone. I’ve been spending a fair amount of time in hospitals and nursing homes and doctor’s offices lately. I keep expecting to hear “Oh, and you should lose weight because ___________” …. but I’m not. Maybe it’s because I’m not the one who’s sick. Maybe it’s because the main risk factor for his cancer is smoking, not weight. Maybe it’s because I don’t have a history of drinking, and he does. I can say it’s been interesting dealing with the medical profession in a situation where it’s not about my weight. These are things that help me stay sane and to have the energy to deal with the other stuff. (Yes, there’s a reason I’ve been posting about managing stress lately.) Even so, it’s still been getting me down. About 2 months ago I saw my ARNP with “Hi, here’s what’s going on.” We determined that yes, I’m having insomnia, anxiety, and depression symptoms. She started me on ambien (to help me sleep) and celexa (for depression and anxiety). The ambien helped almost immediately; the celexa, as is usual for SSRIs, took longer to kick in. I am feeling more able to cope now, which is good. Has this changed my priorities or my sense of what’s important? Yes. And no. As is common when I’m stressed, I’m more focused on self-care; this has all narrowed my focus, often to just “what tasks I need to get done today” and “what I need (to take of myself) so I CAN get through today.” But the things that I most want to do, and that I find most rewarding, haven’t changed. Medical Insurance Helps People Feel Better!? When poor people are given medical insurance, they not only find regular doctors and see doctors more often but they also feel better, are less depressed and are better able to maintain financial stability, according to a new, large-scale study that provides the first rigorously controlled assessment of the impact of Medicaid. In other news, water is wet? Not quite. The study became possible because of an unusual situation in Oregon. In 2008, the state wanted to expand its Medicaid program to include more uninsured people but could afford to add only 10,000 to its rolls. Yet nearly 90,000 applied. Oregon decided to select the 10,000 by lottery. Economists were electrified. Here was their chance to compare those who got insurance with those who were randomly assigned to go without it. No one had ever done anything like that before, in part because it would be considered unethical to devise a study that would explicitly deny some people coverage while giving it to others. But this situation was perfect for assessing the impact of Medicaid, said Katherine Baicker, professor of health economics at the Harvard School of Public Health. Dr. Baicker and Amy Finkelstein, professor of economics at M.I.T., are the principal investigators for the study. In good news, Oregon did end up finding the money to insure the other 80,000 people within 2 years. A review of the book Deadly Spin, which is an inside look at how for-profit insurance companies use PR to make their policies palatable. Conflating fatness with binge eating is no different from conflating anorexia with thinness. You can’t tell how someone eats from how they look. Lyrics are on in this here PDF. Science doesn’t understand? Or doesn’t ask? As if they’ve tried and tried and tried, but women are somehow outside the realms of understanding. Scientists know, of course, that women are not men. But they often rely on male subjects exclusively, particularly in the exercise-science realm, where, numerically, fewer female athletes exist to be studied. But when sports scientists recreate classic men-only experiments with distaff subjects, the women often react quite differently. Science only knows what it studies, and studies repeatedly, with consistent results. If you don’t study women, you aren’t going to know, and you certainly won’t understand. Science can’t find the answers when it doesn’t ask the questions. [W]e are not in the midst of an obesity epidemic, as it is often claimed. We are in the midst of an epidemic of disordered eating. The solutions prescribed to combat obesity are often the same behaviours we as practitioners are diagnosing in those suffering from eating disorders. The comments are a mix of good and bad, but don’t read them if you don’t feel up to the crazies. Meowser kicked in a terrific debunking of the new “epidemic” of childhood type 2 diabetes. Back in the US, Misleading claims about Safeway wellness incentives blows a few holes in the claims of Safeway CEO Steven Burd that the company’s wellness incentives (reducing insurance premiums for those below a certain BMI, blood pressure measurement, and/or cholesterol measurement) enabled them to keep health costs constant for four years. A review of Safeway documents and interviews with company officials show the company did not keep health-care costs flat for four years. Those costs did drop in 2006, by 12.5 percent. That was when the company overhauled its benefits, according to Safeway Senior Vice President Ken Shachmut. The decline had nothing to do with tying employees’ premiums to test results. That element of Safeway’s benefits plan was not implemented until 2009, Shachmut said. […] Today, costs are slightly higher than in 2005, Shachmut said. So they cut benefits in 2006, had benefits increase through 2009, and they’re claiming it’s due to the wellness incentives introduced in 2009? There’s more, a lot more – for example, costs increased more than average during 2009 – you know, the year the incentives were rolled out – and the incentives plan is only available to the 28,000 nonunion office employees, which is a small part of Safeway’s 200,000 workers. The fact that significant weight loss is nearly impossible to maintain poses yet another problem for outcome-based wellness plans. It’s a safe bet that any obese person who manages to score the Safeway discount in a given year will be back in the penalty a few years later. That means plan members are incentivized to enter a cycle of yo-yo dieting, which may actually increase their risks of cardiovascular disease (although not all researchers agree on the dangers of weight cycling). Personally, I think Safeway’s been identifying too much with Catbert. What would you put into a Fitness for Life class? Everyone’s talking about Lincoln college requiring students with a BMI of 30 or larger to take a “Fitness for Life” class. What I’m wondering is, what would you like to see in such a class? Not what is usually in such classes, or what Lincoln is including — what would rock your socks to see? A repost from January, inspired by Fillyjonk’s post quoting Three Men in a Boat. I got Connie Willis’ comedic time-travel novel To Say Nothing of the Dog from the library (and liked it enough to buy it). It starts off a little confusing but is pretty funny, and full of golden age mystery fiction references. And don’t stuff up your head with things you don’t understand. I find myself wondering how realistic that prescription was at the time – and what the current prescription would be. Whole grains, fruits & vegetables every day. 1 glass red wine each evening. 1 three-mile walk every morning. And don’t believe everything you read. “Exercise is my obsession,” states Gina Kolata on page 3 of her book Ultimate Fitness. Why does Kolata love exercise? “I discovered that if I work out really hard and for at least forty minutes, I can sometimes reach an almost indescribable state of sheer exhilaration.” By the end of the book Kolata admits to belonging to three gyms. The book is nearly a love letter to exercise, blending science and history with memoir into an exploration of exercise and the exercise industry. 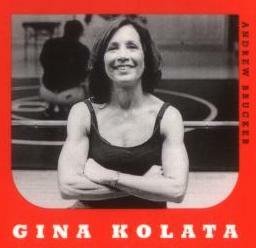 Kolata uses Spinning, her current favorite cardio exercise, almost as a case study for much of the book, which can be a weakness. (Why so much focus on one brand?) But to my mind the biggest weakness of the book is the actual title: Ultimate Fitness: The Quest for Truth about Health and Exercise. Is it an exercise book? A spiritual book? Neither. But this is a book I turn to over and over again. I go to look up a sample training program and get caught up in the story. For an overview, I’m typing in the table of contents and adding my own notes (in italics). Links are to related articles by Kolata. How Much Is Enough? Researchers were surprised to find that the biggest fitness gain is when a sedentary person begins a moderate (like walking) program a few days a week (which can also be had in day-to-day life); medical advice through the 60s worried that might exercise enlarged the heart and overstressed cardiac patients; exercise doesn’t always increase health; do healthy people just enjoy exercise more? Ah, the truth about exercise? Well, I suspect that exercise is more often a marker of health than its cause—healthy people like to exercise more than unhealthy people to start with. And the real value of it is not in terms of abstract health benefits like longevity—an extra few hours or maybe months—but because it feels good when you do it or when it’s over. To hell with Hygeia; the truth lies in pleasure. Kolata is most known through the fat-o-sphere for her book Rethinking Thin and her science reporting for The New York Times. Occasionally it’s clear that Ultimate Fitness was written before Rethinking Thin; Kolata assumes her exercising keeps her thinner; she notes that some aspiring fitness instructors do not appear fit (because of course fitness can be determined by appearance alone). This book is useful to fat acceptance advocates because many of the myths it debunks (20 minutes of walking a day will make you thin! Everyone gets bulky with weights! Everyone gets a runner’s high if they run!) are often pushed as ways to lose weight—and don’t work. I originally got this from the library—and liked it enough to buy it. The San Francisco Chronicle review of Ultimate Fitness. The New York Times review of Ultimate Fitness. The New York Times also has an Exercise reference section. The initial article, Does Exercise Really Keep Us Healthy?, is written by Kolata and touches on many of the points made in the book. Google Books has a preview of Ultimate Fitness. Ultimate Fitness on Amazon, with preview. *Writing in 2002, Kolata summarized the research for the Times as well as in the book. In 2008 she reported on new research which provides more support for the endorphin theory. After reading both the Association for Size Diversity and Health’s press release and Laura Frater’s post on the CDC’s LEAN Works site I went and took a look at it. These two references are certainly not the sum total of what could be said, but they do make a good introduction to the topic. In answer to the question about how the site could be improved, I suggested they make use of the “Active At Any Size” information from the NIH (it’s actually NIH Publication No. 04–4352, and I included a link to it as well).